Few years ago, when it was reported that Wayne Rooney had hair transplant scores of follicularly-challenged male around the UK were seeing the light at the end of the tunnel who were desperately looking for the baldness cure. The surgeons that Nu Cosmetic Clinic refer you to have the most extensive repertoire of carrying out hair transplant procedure in UK. They all are member of The International Society of Hair Restoration Surgery (ISHRS) and have experienced in carrying out FUE or FUT procedures for hair transplant for the male audience. The surgeons Nu Cosmetic Clinic refer you to have the expertise to offer Unshaven FUE (UFUE) and treat Afro Caribbean or asian hair loss, as well as eyebrows, eye lash, beard and facial hair transplant apart from PRP and mesotherapy treatment for hair loss or thinning. 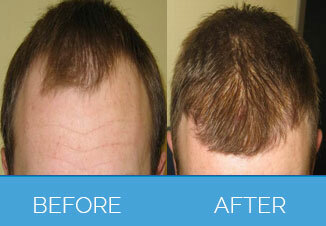 By the time they reach 50, around 53% of men will have been subject to some degree of hair loss. 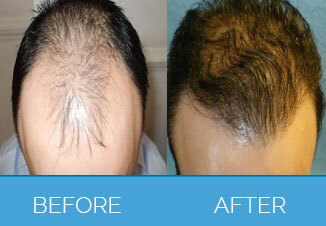 For some men also, this loss can occur at an earlier age with visible thinning hair arising in their early 20´s or 30´s. Androgenetic Alopecia, or male pattern baldness is main the main cause for around 95% of men who experience hair thinning. 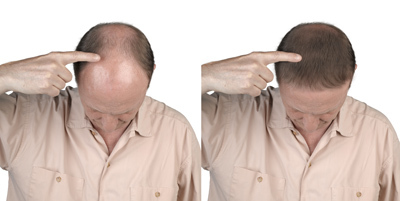 This genetic condition transpires when a specific male hormone causes specific follicles to reduce and produce eccentric hair with a shorter life span.In classic male pattern baldness, it is usual to see hair loss around the crown area, which extends to the hairline and temples, then the mid-anterior scalp. 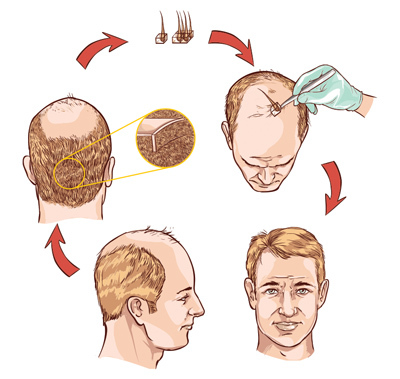 The experience of this condition does vary between men along with visible pattern baldness depending on the patient. in addition to heredity genetics, a range of other factors can also cause hair loss. Reactions to medication, disease and stress can also present different problems to different men. For many men, hair loss is more than a visible thinning or a receding hairline, it can also have a huge impact on confidence and self-esteem, which is important to acknowledge. It is recommended to seek advice with a consultant surgeon whilst the hair loss is in its early stages. The surgeon / Trichologist will be able to review and identify the extent of hair loss and provide strategies for further action. The market is full of medication, supplements and products which do offer an effective way to control and prevent hair loss; however when the thinning has given way to baldness, hair transplantation is the only proven way to restore the area with hair more permanently. Follicular Unit Extraction (FUE) is a semi invasive surgical procedure which involves removing robust hair follicles from a donor area (which is normally at the back of the scalp, where hair tends to be thicker) and they are then transplanted directly onto the bald or thinning areas of the scalp. Hair transplantation is normally carried out under local anaesthetic which can help to eliminate risks and recovery time associated with the other more invasive procedures requiring a general anaesthetic. Because FUE is minimally invasive, there are no visible scars and a return to a normal life / work can be achieved the following day. 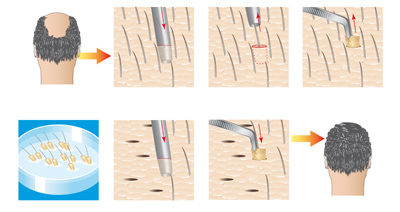 Follicular Unit Extraction uses a surgical punch apparatus (between 0.6mm -0.9mm) to detach follicular units and glands. This detachmentseparates the immediate tissue surrounding the follicle unit which gives better results and minimal trauma, as well as a minimal risk of any visual scarring. Because of the transplantation of all elements of the hair follicle, this procedure gives a better survival and hair growth rate. The surgeon performs this treatment under an industrial microscope with custom made instruments to attain a high degree of precision for minimal scarring and a natural looking end result. FUE is a minimally invasive procedure which is carried out under local anaesthetic. It is not uncommon for patients to watch TV or simply relax during the operation. Unlike the more invasive FUT procedure, patients will not require strips of stitches after the surgery. This reduces the amount of discomfort, recovery time and scarring. Following FUE transplantation, patients are free to wear their hair long or short, thanks to the procedures elimination of linear scarring and stitches. 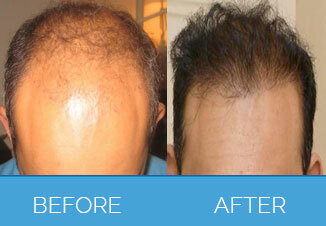 FUE is completed on a hair by hair basis and not by bulk donor grafts. This helps surgeons to ensure that their patients get the strongest, healthiest hair follicles donated. 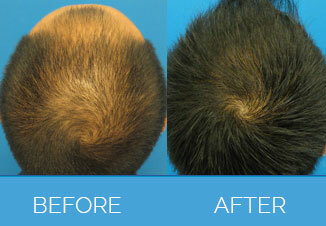 The final FUE result will display a natural looking layer of hair with denser packed follicles. The surgeon will insure that the healthy donor hair is implanted with the direction of the natural hair growth for a denser, fuller look. As the industry´s specialist FUE hair transplant surgeons offer the most advanced, minimally invasive transplantation options that are available on the market today, patients are left with no visible linear scarring for a minimal amount of discomfort and down time. Patients will be able to see the emergence of the new growth pattern line directly after the operation, with the transplanted hair having been fully established and re-grown around 12 months later. Gordon is a middle aged professional working within the creative industry. Recently, he underwent a hair transplant to counteract a receding hairline. “As I am reaching a certain age, I decided to hold back time a little and to prevent any more hair loss” he quoted. Gordon made the appointment at his local Nu Cosmetic clinic in Liverpool after researching his options for clinics on-line. A combination of excellent feedback and information were the main criteria that took him to the Rodney Street branch in Liverpool. “I was warmly greeted, and on the day of the consultation I met with two consultants. We all sat down, with diagrams of typical pattern baldness, my remediation criteria and of course, an indication of scalp as it was at present, highlighting my areas of hair loss and potential thinning.” During the consultation, Gordon knew that he was in good hands, as constant communication and precedence studies clarified all his doubts, and attainable results. The actual possibilities to counteract his hair loss were now becoming a reality, as the case studies and pictorial database of previous clients assured. Any form of cosmetic enhancement is very personal, so prices are bespoke dependent on your individual needs. A definitive price for your procedure will be given at your free consultation with your cosmetic surgeon or relevant specialist practitioner. Remember, we often have offers & can sometimes price match other providers, so call us on 08000 30 29 30 with any queries.